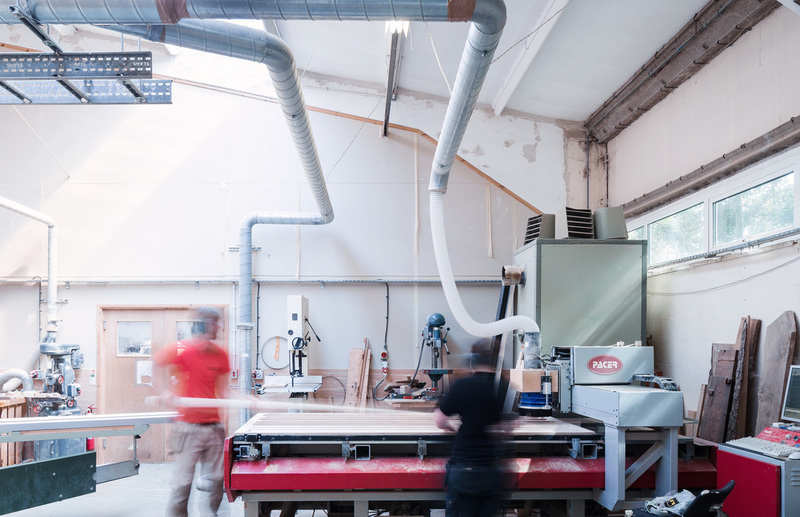 Our mission here at Opendesk is to change the way products are designed and made - putting the spotlight back on real people (the producers in our supply chain), and bringing social, environmental and economic sustainability to the fore to achieve a more open and balanced mode of production. In order to achieve this we also believe we need to practice what we preach and over the coming weeks and months we’ll be looking to open up ourselves, and share more about the way the team here at Opendesk are working and thinking - to give you a broader insight into our processes, learning and aspirations. You may already have started to see the green shoots of this new initiative (check out Ben’s recent post about the art of sharing and stay tuned for our Inside Opendesk videos!). We should probably start by clarifying what we mean by ‘product’ in this context. 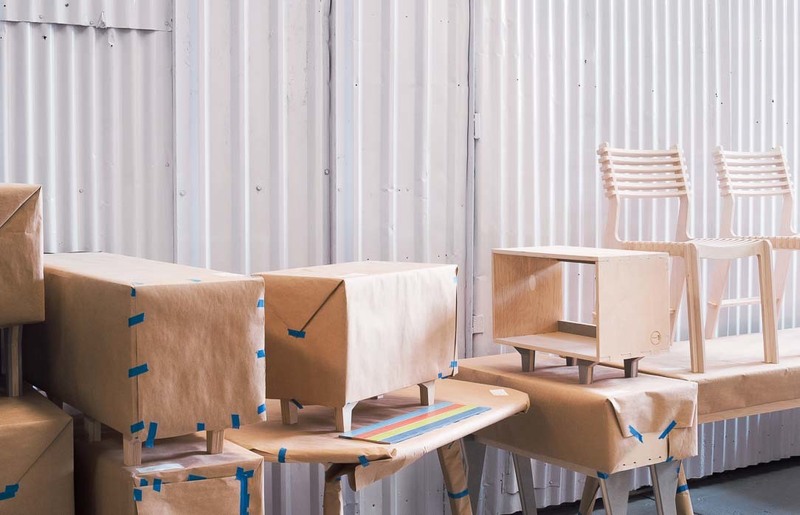 Just to confuse you, we’re going to talk less about the real physical furniture products we work with (all that lovely plywood) and more about the overall product that is the Opendesk business and website. This is the Product according to a technology company, as opposed to the product according to a design or manufacturing company (…we warned you it could get confusing!). By way of a simple disambiguation of these two concepts, in practice we often talk about ‘platform development’ in our day to day work. By extension, we talk about a Platform team (the product team in normal startup parlance) , whose primary goal is to facilitate effective processes and internal collaboration to deliver the best outcomes. We prefer to think of our entire team as contributing to the development of Opendesk by definition (not to mention our entire community!) - but the platform team’s responsibility is to make sure everyone else is able to work effectively and that our technology and experience can deliver to our team, our community and our customers. Through this series of posts we’ll be looking to lift the hood on the way we approach platform development at Opendesk, to give you an inside view on the tools we use and the way we work to prioritise design and development work and figure out what’s important. We’ll also be honest about all the things we are still figuring out so if you have any insights of your own please do share them. In describing our product process in this way we also want to invite you to contribute. We’ll explain how we aim to bake feedback and sharing into our workflow in the hopes of delivering the best experiences we can for you. Moving forward we’re committed to gathering more thoughts directly from our community, to help steer the development of our core business and website - doubling down on delivering genuine value to the producers and supporters on which our whole model relies (our makers, designers, and customers). Perhaps the first thing to say about ‘product processes’ in startups is that we suspect they’re much messier in reality and considerably less rigid than they sound - less like ‘grandma’s secret recipe’ for successful product development, and more like ongoing processes of refinement seeking to unlock the right behaviours to enable collaboration and shared learning (ultimately striving to build the right product). At Opendesk we’re relatively new to all this (we only officially instituted a ‘product team’ in October, coinciding with the arrival of Kirsty, Josh, and Andreas), and we seldom find we are sticking religiously to a single format for long - rather, we find it’s a process of iterating on a theme as we figure out what works best for us. However we do find ourselves returning time and time again to a core suite of underlying tools, and it’s these tools that we’d like to discuss first. 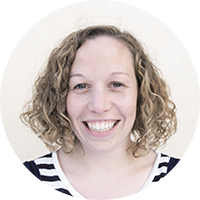 In some respects we’ll be describing how we use tools to prototype, or ‘build tools on top of tools’, and how we strive to learn quickly along the way. Post-It Notes are an easy one to start with. We love them. We use Post-It notes on a daily basis to try to organise our thoughts, scribble down ideas, and stick things on walls (or each other!). 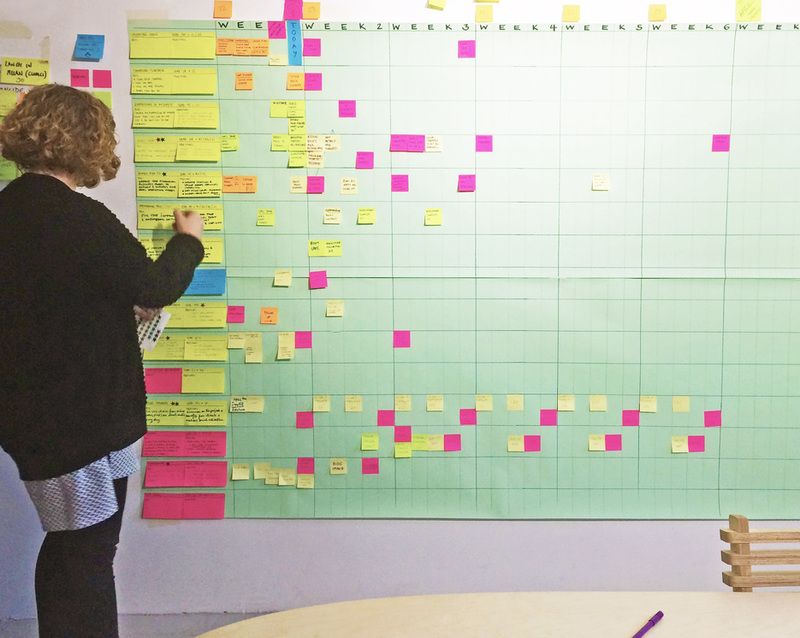 Here is an example of Kirsty at our Content Management planner covered in lovely colour-coded Post-Its. Google Docs is another easy one. Most people know how Google Docs and Sheets work and for the most part we use them just like anybody else. 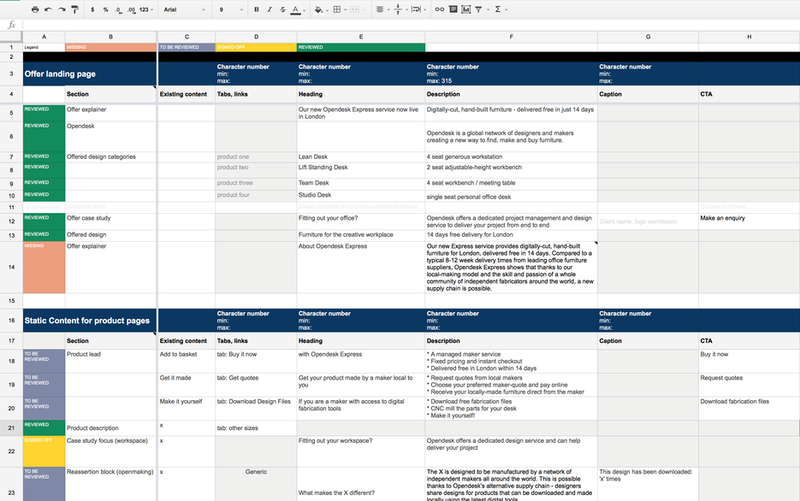 However we also like to use the Google Suite (in particular Sheets) as prototyping and ‘mapping’ tools. We often use sheets to organise information, test hypotheses about information-architecture, and generally plan stuff. This is one of Andreas’ tools we used during launch of our Express Service. From structuring a project, to organizing your sales team, to transforming the way your entire company works together. Podio can help you simply get the job done, or grow with you to connect all your work in one place. 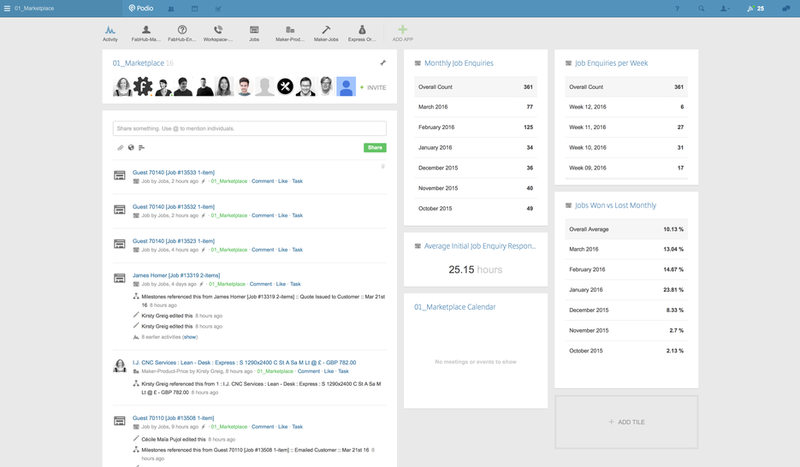 They could be forgiven for sounding a little vague or hard to pin-down - that’s because Podio is an incredibly flexible tool in practice, which can be configured to do almost anything you need it to to support your business processes - a project management, CRM, and team collaboration tool all rolled into one… and a whole lot more to boot. The one thing we have never heard Podio described as is pretty much exactly what we use it for here at Opendesk - ‘a functional prototyping tool for your startup’. Podio is structured as a series of ‘Workspaces’, each containing a collection of simple ‘Apps’ of your choosing (you can install preconfigured apps or create your own). For example you might have a Workspace entitled ‘Project-Management’, containing Apps for ‘Customers’, ‘Leads’ and ‘Projects’. Each App stores individual Items as entries of information, and you configure your Apps such that each Item stores data fields in various structured types (for example, text, number, date etc). You can then associate Apps together to create a simple relational database, and configure automated workflows that are triggered when certain data is entered. Finally, you can generate simple reports to query the contents of individual Apps. In this way Podio allows you to define your own flexible processes and workflows and manage relatively rich content-types and data entry through their simple front-end web interface. 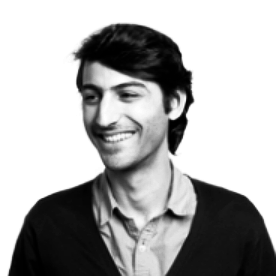 With Podio, even those with modest technical or development skills (like ourselves!) can begin to create apps for storing structured information and then enter, manage and report on that data in their day to day business operations. Mostly Podio is used by businesses to manage information, but we find it doubles as an excellent tool for validating business-flows, and for empowering team members to test and validate workflows and data-structures that fit their working behaviours. In practice, we use Podio as both a product-development tool to test assumptions about how the business should be organised, and as a genuine operational tool (CRM, management of worklists etc). In a future post we’ll be sharing in more detail how we use Podio’s app structure to manage all sorts of useful information and organise workflows, how we integrate it with the real data coming off our website, and how we’re using it to prototype almost every aspect of the Opendesk business before the development team get stuck into the real work! 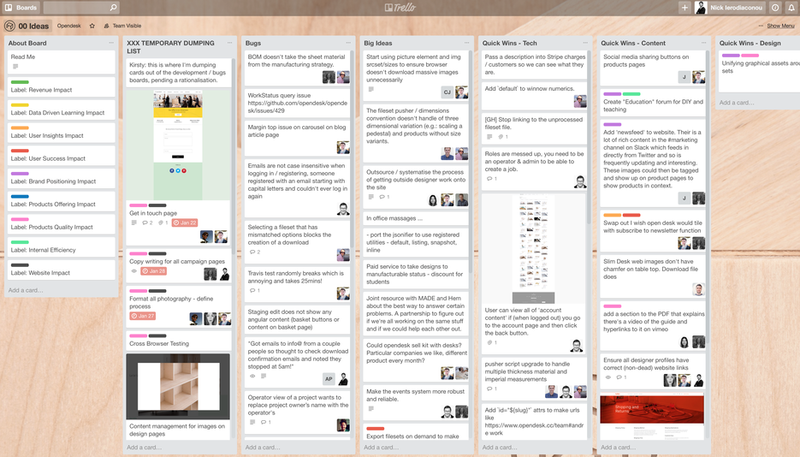 Trello is a simple and beautiful online project management tool based on a ‘Kanban’ model. For those who are new to the concept, Kanban is a model for capturing and prioritising ideas and tasks based on a framework of simple structured lists and cards (or ‘tickets’). The Kanban paradigm originally grew out of Toyota’s Lean Manufacturing Production System before being adopted in more recent years by tech startups around the world - as you can imagine, it’s an analogy we are pretty fond of here at Opendesk, alongside a few other fancy Toyota concepts like ‘Autonomation’ (more on this later!). In Kanban individual cards, typically representing discrete tasks, are moved between lists (columns) as they progress through states of completion or development (e.g. ‘to do’, ‘doing’, ‘done!’), and up and down lists as they go up and down in priority (most urgent or important at the top, least important at the bottom). At Opendesk we use Trello to capture ideas, break them down into manageable development tasks, and then triage and prioritise them before individuals claim them and get to work. Below is an example of one of our Trello boards for capturing new Ideas. Perhaps our most relevant Trello board in the context of our recent drive to ‘open out’ is our public ‘Wish Opendesk Would’ Board. We’re launching this to try to gather feedback from our users and community and get a sense of how we’re doing so we can be as responsive as possible. We’ll cover the launch of this board in a sister-post, but the important thing to note about this is it’s a way to keep structured feedback from our community in a context where it can then feed back into our core development work through our weekly triage process (about which more in future posts). Ok, that’s all for now folks. In our next post on our product process we’ll look in more detail at the way we use Trello to triage features and development work. In the meantime please do check out our public board and let us know what you Wish Opendesk Would do!